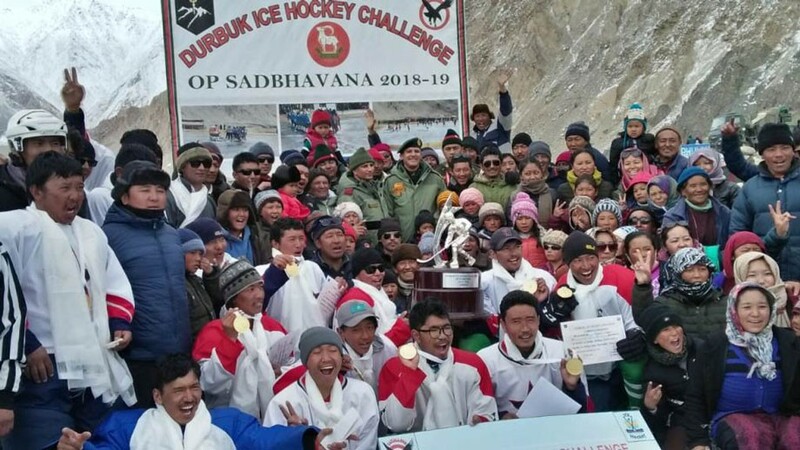 In the first Durbuk Ice Hockey Challenge 2018-2019, DSC Red team beats Shachukul team on February 14 in Durbuk. The championship was conducted under Operation Sadbhavana under the aegis of 81 Mountain Brigade (Patiala Brigade). A total of eight teams participated in the tournament. Brigadier Manoj K Mathur Commander 81 Mountain Brigade, chief guest gave away Rolling Trophy to the winning team. The runners up and participating teams were also awarded. The tournament aims to support and promote Ice Hockey in eastern Ladakh region and encourage local talents to take up the game professionally. Also, it aims to motivate young girls and boys in the region to join the Indian Army. Cultural programmes, Ice Skating Pipe Band of Ladakh Scouts Regimental Centre, Leh was also showcased.